Celebrated for his co-discovery of the principle of natural selection and other major contributions to evolutionary biology, Alfred Russel Wallace (1823-1913) also wrote widely on the social, political, and environmental aspects of scientific and technological advance. These latter, if far less familiar, ideas constitute an astute critique of the Victorian concept of progress. Wallace was hardly alone among nineteenth-century thinkers in regarding scientific advances as ambivalent in terms of human progress. But most critics of scientific progress saw its problems in religious or aesthetic terms. Wallace’s critique was atypical in two respects. First, almost alone among the major scientists of the nineteenth, and very early twentieth, century, Wallace had profound misgivings about techno-scientific progress as an end in itself. Second, he embedded science deeply within both a sociopolitical and an environmental context and viewed science as a real and/or potential exacerbation of tensions in both of those settings. Today, on the occasion of Wallace’s birthday, I would like to highlight briefly some major facets of his critique of the ‘cult of progress’. His increasingly acerbic jeremiads against unregulated ‘progress’ resonate significantly with similar concerns in our own day. Wallace’s prolonged residences in indigenous communities in South America and the Malay Archipelago during the periods 1848-1852 and 1854-1862 compelled him to question whether Europe had attained that pinnacle of social and moral development that its undoubted scientific and material progress rendered axiomatic to many Victorians. Similarly, a lecture tour of North America during 1886-1887 provided him with abundant evidence of the baleful effects of rapid industrial expansion in many regions of the United States. In North America, Wallace believed he had witnessed evolution run amuck: the cult of progress had triumphantly obliterated any constraints, ethical as well as socioeconomic. In response to these and similar experiences, Wallace developed a framework—from the seemingly disparate fields of evolutionary biology, geology, economics (especially land reform measures), socialism, and spiritualism—for analysing the socio-political and environmental consequences of techno-scientific change. Importantly, Wallace never sought merely a return to some imagined halcyon rural paradise of old. He “wanted to foster a thoroughly ‘modern’ ecological connection between man, nature, and the land”. 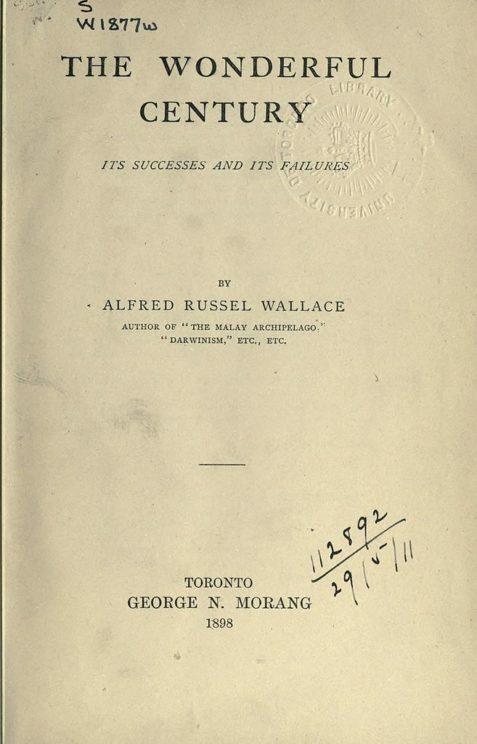 Title page of Wallace’s The Wonderful Century: Its Successes and Its Failures. Biodiversity Heritage Library. Public Domain via Wikimedia Commons. In 1898, Wallace published the ironically titled The Wonderful Century: Its Successes and Failures. Here, he provided a sophisticated deconstruction of many of the icons of late nineteenth-century materialism. Wallace singled out nineteenth-century militarism as a first main target, especially as it has been augmented “by the application to war purposes of those mechanical inventions and scientific discoveries which, properly used, should bring peace and plenty to all, but which, when seized upon by the spirit of militarism, directly tend to enmity among nations and to the misery of the people”. But it is ‘the demon of greed’ that poses in Wallace’s mind a more immediate threat: the enormous and continuous growth of wealth in the Victorian era, without any corresponding increase in the well-being of the general population. For Wallace, it was not science itself but rather capitalism’s myopic deployment of scientific discovery and technology that distorted the industrializing world of the nineteenth century and gave the enormous increase of material productive power almost entirely to the “capitalists, leaving the actual producers of it—the industrial workers and inventors—little, if any, better off than before”. When to this cauldron of inequity is added “the enormous injury to health and shortening of life due to unhealthy and dangerous trades, almost all of which could be made healthy and safe if human life were estimated as of equal value with the acquisition of wealth by individuals,” it becomes clear why Wallace’s critique was so unpalatable to many late Victorian leaders and would be similarly disparaged by many in power today. One need think only of such climate change skeptics as President-elect Donald Trump and many corporate leaders to see the modern parallels. In the final chapter of Wonderful Century, starkly entitled “The Plunder of the Earth”, Wallace ties environmental concerns directly to the bulk of social, political, and moral deficits of the nineteenth century. His arguments here are reflective of those other thinkers and activists who articulated a set of environmental concerns—including the decrease in natural resources, the fate of “sublime” wilderness, and increasing pollution—in Britain and the United States during the second half of the nineteenth century. But most such arguments proved feeble against the onslaught of the powerful forces of Victorian industrialism. Hopefully, Wallace’s critique of progress will find a larger, more receptive audience in our own day when the baleful cultural and environmental consequences of Victorian progress that Wallace perceived—especially the frenzied global attempt to adapt industry and agriculture to the demands of quick and ever-increasing profitability—are magnified enormously. Featured Image credit: Portrait of Alfred Russel Wallace published in Borderland Magazine, April 1896 by London Stereoscopic & Photographic Company. Public Domain via Wikimedia Commons. Martin Fichman is Professor Emeritus of History and Humanities at York University, Toronto. He is a leading scholar on the life and work of Alfred Russel Wallace. He has published numerous articles and four books on the history of science and its cultural contexts, including: An Elusive Victorian: the Evolution of Alfred Russel Wallace (University of Chicago Press, 2004).